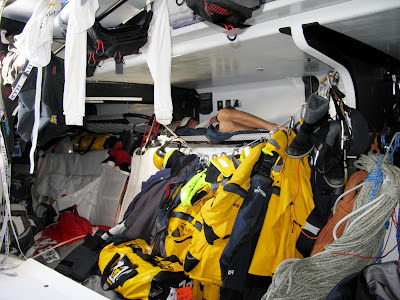 On Board RUS -1 Kosatka Team Russia On a long voyage you become accustomed to your environment around you. The watch system shapes your days, four on four off four on four off. The freeze-dried food you eat tastes the same as it did the day before and the day before that. The clothes you put on all have the same logo as the one you put on yesterday and the one you put on the day before that. It all smells the same; it all has that musty damp sailing bag, man smell. The definitive goal, to win the leg, to beat the opposition, to push hard to the horizon, never changes. The sensation of speed has become rhythmical as we muscle over the waves. Sharp pull to the left, hold, lunge forward, small smile to ones-self as in respect to the power under your feet and the faith we have in this craft. The bow fires down the wave face, judders as we accelerate up to the high twenties, force forward as we plow into the wave ahead and decelerate, sway right and climb the back of the wave with a kind “I’m come through like it or not” feeling and into the circle again. This is translated into different forces on your body whether you are in your bunk or hanging on the grinder handles or on the bow battling the spray and deck wash, or even gripping the media desks slippery shiny carbon edge as I try to tap out a Blog using only one hand. You have conversations with other crew all doing the same strange sway, bob and totter. Filmed by a fixed camera held stationary on the bulkhead people look like they are performing an exotic courtship dance. The waves fly by as if in an aquatic tube coming into a station with blue waves instead of billboards. Occasionally, you focus on the leeward wash as it grabs your eye and forces it to follow through to the water exiting the transom. The torrid waves that the bow eats up are spat out behind us, washed and ironed, cleaned and pressed -good enough for Neptune’s Sunday best. The shear power of these boats becomes an extension of the crew that operates them. One finger can cant tones of swinging lead to unleash yet more power. The words you learned at school in a physics lesson and never meant that much to you now bring new meaning. Words like Kinetic, Potential, Inertia and Dynamic Loads all start represent something tangible on board. This trip is slowly stripping me back. I’m seeing things in a very uncluttered way, almost child like, without preconceptions, very mater-of-fact. Strangely, I’ve been waking up from heavy sleep in the fetal position curled round the beanbag with the sound of the ocean around me. On a long voyage you become accustomed to your environment around you, as if you have lived here forever.